The craft of Italian salumi, now accessible to the American cook, from the authors of the best-selling Charcuterie. Start reading Salumi: The Craft of Italian Dry Curing on your Kindle in under a minute. Good food writing, like good travel writing, ought to be interesting enough to be enjoyed for its own sake, even if the subject turns out not to be some misty romantic destination or some fabulously exotic cuisine. 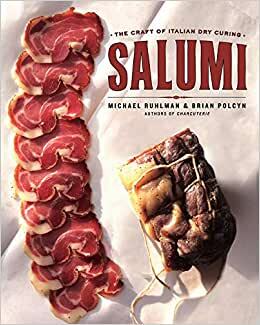 ...Thus anyone who has ever enjoyed a really good slice of salami, prosciutto, sopressata, mortadella or capocola will thoroughly appreciate Salumi, Michael Ruhlman and Brian Polcyn's comprehensive guide to the ancient Italian art of dry-curing meat. ...The authors unravel... many...culinary mysteries and--along with giving detailed, from-scratch recipes for more 100 varieties of salumi--include helpful information on equipment, prep techniques and ingredient sources. --Aram Bakshian Jr.
Michael Ruhlman has written and coauthored many bestsellers, among them The Soul of a Chef, The French Laundry Cookbook, Ratio, and other books. He lives in New York City and Providence, Rhode Island, with his wife, Ann Hood. It's great finally to have a book in English dedicated to the subject of Italian cured meats, but - since it's the only book we're likely to have - it's disappointing that's it's not better. In several respects, this book does improve on their Charcuterie book. First, they no longer recommend the grinder attachment for the Kitchen Aid mixer, since it can't handle partially frozen meat, the auger churns it too much, and its dull blades smear rather than shear the fat, all resulting in sausages with poor texture. If they'd `fessed up about this 7 years ago, they'd have saved aspiring sausage makers a lot of frustration. Second, their salami recipes now say that the meat should sit for up to a day after salting and grinding, before finally mixing and stuffing . This extra step allows the salt to extract myosin (a protein in meat, like the gluten in wheat), which makes for a good "bind" in the final product. But in other respects, this book reads like time has stood still or the authors have missed out on new developments. For curing whole muscles, they continue to rely on the traditional "salt-box" method, where the meat is simply kept covered with salt, one day for each couple of pounds. The fact that they equate 2 pounds to 1 kilogram (when it's actually 0.9) tells you a lot about the imprecision of this method. A better method, which yields more consistent results and won't have you going through boxes of salt is equilibrium brining. Once you know how much salt is to your liking, you weigh the meat (plus whatever liquid you're adding), use your ratio to calculate the amount of salt needed (I like .25 oz or 7 g per pound), and then hold it in a vacuum or Ziploc bag until the salt has been absorbed and the brine and the meat reach "equilibrium," injecting larger muscles with the cure. You'll also find no mention of sodium phosphates, even though they've long been available from their favorite supply house, Butcher-Packer. As other recent books, such as Modernist Cuisine, explain, sodium phosphates are a useful additive for dissolving myosin and accelerating the development of a cured flavor. Similarly, you'll find no mention of vacuum-sealing, sous vide, or even the use of a simple temperature controller to create a precisely calibrated water bath. And if you found some of the recipes in Charcuterie to be unpalatably salty (and I have quite a salt tooth), be warned: the amount of salt called for in Salumi is even higher, as much as 50% higher (consistently 3% of the mix, including curing salt). Most distressing is their continued reliance on a single strain of bacterial culture to ferment all their salami: Bactoferm F-RM-52 (the strain they recommend on page 65). As Butcher-Packer's website explains, F-RM-52 is "the culture recommended for the production of traditional North European types of fermented, dry sausages with a sourly [sic] flavor note." Even Ruhlman and Polcyn confess that the lactic acid produced by this culture results "in a tanginess that is slightly overbearing" (p. 68). Of course it is! This strain is designed to produce the strong sourness characteristic of German fermented sausages and is simply unsuited to making salami. The Christian Hansen culture formulated for southern European types of salami is T-SP-X, and it has been available from Butcher-Packer for about 5 years now. Other recent books on fermented sausages, such as those by Stanley Marianski, recognize that this is the appropriate culture for Italian salami. Similarly, the ingredients called for by the recipes are perplexing. Trapani sea salt is recommended, as "an Italian sea salt from Sicily used all over Italy," but then they freely acknowledge that other ingredients they use a lot in their recipes, such as paprika, are actually uncommon in Italy. For example, their recipe for nduja calls for La Vera pimentón from Spain. If they're calling it "Nduja di Calabria," shouldn't they use actual Calabrian chili peppers, which are now readily available in this country (from The Sausage Debauchery, for example, which is listed among their Resources)? Aside from such lapses or oddities, the book is simply skimpy on meat and long on filler. Those hoping to make Italian salami will find less than 75 pages of recipes, and even these are padded. The steps in making a salame hardly change from recipe to recipe (a different diameter die for the grind, a different diameter casing for the stuffing), yet the authors write out all the steps in full each time, ensuring each recipe fills up 2 pages. And some recipes are basically repetitions. On page 139, they have a recipe for Salamini Cacciatore, calling for equal portions of pork shoulder and wild boar. On page 155, is a recipe for Salsicca di Cinghiale Crudo, which is identical in all its seasonings, just altering the ratio 3 to 1 in favor of the boar and calling for beef middles instead of hog casings. A two-sentence note to one recipe, suggesting this variation, would have sufficed. And the final section of the book is dedicated to "cooking with and serving salumi," with recipes for crostini, roasted garlic, pesto, pizza, chicken stock... Seriously? It's hard for me to believe that anyone who's fanatic enough about Italian food to break down a pig and cure their own pancetta or guanciale could need a recipe for crostini or spaghetti carbonara. Their recipe for serving prosciutto or coppa with fruit says "We have no specific instructions here other than finding excellent ingredients. In terms of quantities, use common sense... Put all the ingredients out on a cutting board, or arrange the ingredients on small plates..." Such "recipes" simply don't deserve the 63 pages that they take up. Since many readers give this book 4 and 5 stars, some may have found my review unduly harsh and "pedantic." I freely admit to being a hard grader. But other readers have pointed out even more serious errors than ones I noted. Writing about guanciale (on p. 88), they say "You can use sodium nitrite here if you wish, for a more bacony, pancetta-like flavor, using 0.25% of the weight of the meat . . . about 1/4 ounce for 5 pounds, or 6 grams for 2 kilograms of meat." This error is repeated on p. 68, in their introduction to dry-curing, where they say, "We believe . . . 0.25% sodium nitrate relative to the weight of the meat to be ideal." If you follow this advice and add 0.25% sodium nitrate or nitrite relative to the weight of the meat, you will be adding 16 TIMES MORE THAN THE USDA ALLOWS AND APPROACHING LEVELS THAT ARE TOXIC. (As the authors note on p 63, 7.1 grams is the toxicity level for a person weighing 220 pounds.) Anyone familiar with curing salts will understand that they are referring instead to pre-mixed cures, cure #2 (which contains 5.67% sodium nitrite and 3.63% sodium nitrate) and cure #1 (which contains 6.25% sodium nitrite or 1/16 exactly) respectively. But for a novice who takes them at their word and makes nitrates/nitrites 0.25% of the mix, this could be a fatal mistake. It's one thing to pad the book out and fail to mention things that could make the salumi better. It's another thing entirely to be inaccurate in your terminology in a way that could lead someone to poison themselves. 510 people found this helpful. When you are taking on the task of dry curing meats, you want to be sure you are safely doing so. While I loved "Charcuterie", and was very excited to get my hands on "Salumi", I was disappointed, like many others, with the obvious lack of detailed editing and recipe testing in Salumi. I won't point out again what others have already pointed out, but I will add that the very first recipe that I was planning to make was the "Speck" recipe in the book, and found a couple of errors. The recipe gives the weight of the meat to be cured at a "4500 gram Pork Shoulder", which gives us the starting point to the rest of the recipe (which is based on the weight of the meat.) He then gives the salt cure measurements, which consist of "225 grams of salt (8.5% of the weight of meat)"...the problem is that 225 grams is only 5% of the weight of the 4500 gram shoulder they are curing, not 8.5%. This calls into question the rest of the cure, including the pink salt and other ingredients (are they based on the weight of meat or the weight of salt?). Also, in the same recipe, the description of the recipe states that "Ours is heavily seasoned with pepper, bay leaf, juniper, nutmeg and cinnamon. "...yet there is no cinnamon in the recipe at all. This, again, was the first recipe I've tried in the book, and found 2 errors...I'm a bit hesitant to try others. I emailed Michael Ruhlman on Nov. 11 to inform him about the errors I've found, but never did ger a reply. I do hope that the second printing of this book fixes the errors that I have found, as well as the ones others have found, as I think this could have been a good book. I do not recommend buying it until then. 59 people found this helpful. I can’t wait to raise some porkers and start. This book lays out step by step what you need to do to make home made dry cured meats. It has easy to understand instructions and goes into the why's behind what you are doing. Have have made 2 types of salumi since buying the book and both came out fantastic.